A 36” flat screen TV, mobile phone and various items of hairdressing equipment were stolen from a flat in Stranraer on Monday (June 5). The theft occured between 11.30am and 1.30pm on Monday 5 June at a flat in Dalrymple Street, Stranraer. 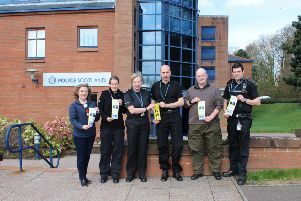 Constable Caillie Douce at Stranraer said: “Investigations are at an early stage however I would be keen to hear from anyone that may have seen anyone in the area acting suspiciously. That includes anyone seen carrying a TV or offering hairdressing equipment for sale. “You can contact me at Stranraer Police Station on the 101 number quoting incident reference PDG0130070617”.